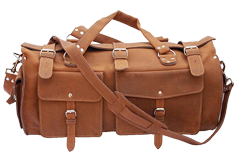 This is a serious duffel bag that is truly unique. The leather is vegetable tanned bull hide which will patina and age beautifully. 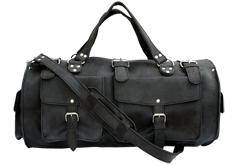 It is a great bag for traveling, carry on luggage, or for the gym. The main compartment is spacious enough to hold a 2-3 day trips worth of stuff or all of your gym gear. The 4 exterior pockets are perfect for accessories and puts them right at your fingertips while the interior pocket keeps you organized. The antiqued hardware adds that "I have traveled around the world many times over" look. 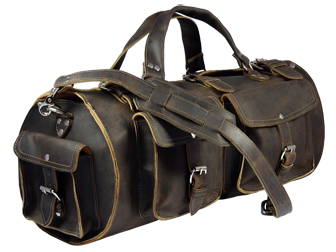 These duffel bags will outlast any old canvas or nylon bag by decades, and look better and better as the years go by. They have a beautiful look that will turn heads at the airport or gym. Rustic Leather stitches this bag with polyester thread that will hold up to water, sun and most chemicals. Rivets are placed at all stress points for added strength & durability. This is a bag that will stand the test of time and unlike us, will only look better over the years! "Great experience! Love the bag!" "Fast ship and great communication. Nice Bag. Nice people. Highly recommended." "Excellent product. Just what I wanted. Leather quality is outstanding. Craftsmanship is impeccable."